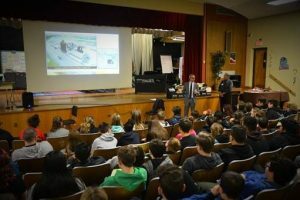 Yesterday, Allan Myers visited Armstrong Middle School, in Bucks County, PA, to help promote Science, Technology Engineering, and Math (STEM) careers in construction. 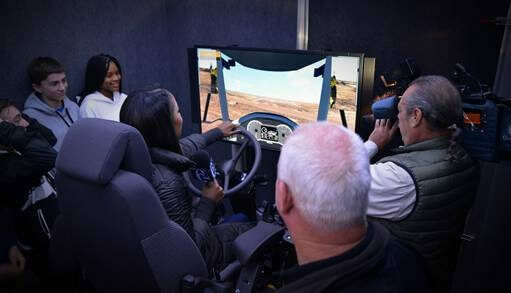 We were able to teach students about using Google Sketch Up for four dimensional models and show them what training is like on our state-of-the-art mobile training center! “This is a great way for kids to not only learn about engineering and the different facets of engineering but to get in and test out the different simulators and see what it’s really like to move that heavy equipment,” said Instructional Coach Dawn Martesi. On this visit, the training center allowed approximately 70 students to learn what it’s like to operate construction equipment, spiking their interest in STEM and showing them how concepts they learn in classes are used practically in the construction industry. “I did something like this in elementary but to this extent, nobody has ever brought it out like this,” said eight grader Taurean Jewett.